Campbell Campbell Edwards & Conroy, P.C. was proud to sponsor Dress for Success Leave Your Bag At The Door – Campbell Conroy & O'Neil, P.C. Campbell Campbell Edwards & Conroy, P.C. was proud to sponsor the June 7, 2018 MassDLA, DRI Women in the Law & The Federation of Defense & Corporate Counsel “Dress for Success Leave Your Bag At The Door” event. Dress for Success is an international not-for-profit organization that empowers women to achieve economic independence by providing a network of support, professional attire and tools to help women thrive in work and in life. Dress for Success has helped more than one million women work towards self-sufficiency since its inception in 1997. 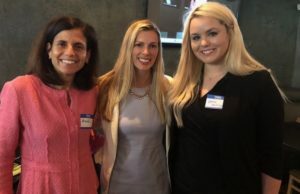 Board of Director and MassDLA President Michelle I. Schaffer, Associate Jessica Bowen and Associate Katherine M. Milligan took part in this year’s “Dress for Success Leave Your Bag At The Door” event.